The year before I started blogging, my great-uncle, Harry "Woo-Woo" Stevens passed away. Harry was a well known entertainer, famous for his banjo playing. Having played in Broadway musicals, Hollywood movie score orchestras, Vegas nightclubs, Disney & Princess cruises to name a few venues, he rubbed elbows with some pretty famous celebrities. But his first love was baseball. 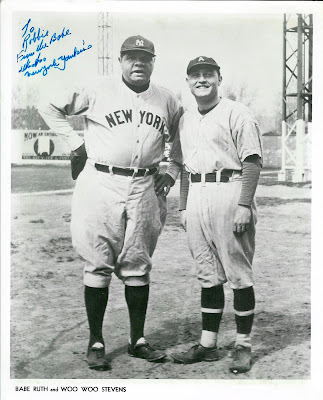 Leaving his rural home in Kentucky for The Big Apple, Woo Woo attended open tryouts with the New York Yankees in 1934. He gave this picture to me during one of his visits when I was 8-years old. You could say it is the first piece of memorabilia I ever had and obviously made an indelible impression that left me in awe. The following is an excerpt from an article that appeared in the Orange County Register after his passing. Although hearing the story firsthand from my uncle was far better. "As a young man, his real love was baseball, and at age 23, he took a train to New York in the hope of playing ball with the Yankees. It's unclear whether he had the talent to make it as a baseball player, but it is established he was plucking his banjo in the team's locker room one day when Babe Ruth heard him and took him to the Major Bowes Original Amateur Hour talent show. Woo Woo won $250 and spent the rest of his life on stage, strumming and singing his way from coast to coast." You can read the rest of the article here. It's a fun read about a man who lived life to the fullest and called such iconic figures of Americana as Babe Ruth and John Wayne, his friends. That's a great story. He must've had lots of cool stories to tell. Thanks for sharing. I have pictures of your great uncle with my older brothers when he played at my parent's nightclub (Ho-Ti) in Portland Oregon in the early 60's.